Note: Forward-looking statements in this section about the procedure or schedule of legal deliberations in relation to integrated resorts including casinos and other forward-looking statements are based on information currently available to the Group. The Group does not guarantee that such statements are accurate or that events will transpire in accordance with such statements. Therefore, placing undue reliance on this information is not advised. Currently, there are casinos in more than 120 countries. In all G8 countries except Japan casinos are legal. As of 2010, the casino business worldwide was estimated to be worth approximately US$117.6 billion. By 2015, this is projected to grow to US$182.8 billion. The largest market is Las Vegas, with the United States accounting for roughly half of the world's market, or US$57.5 billion. Meanwhile, the Asia-Pacific region has been increasing its presence rapidly in recent years. Fueled by the conspicuous economic growth in China and other parts of Asia, the value of this market has jumped from US$13.7 billion in 2006 to US$34.3 billion in 2010. In particular, 2010 saw the Asia-Pacific region's market grow a steep 49.7% from the previous year. Leading this growth was the world-class casino hub Macau, which posted a phenomenal year-on-year increase of 57.8% in 2010. Furthermore, after granting licenses in 2006, Singapore unveiled two integrated resorts including casinos in 2010. With these markets as drivers, the Asia-Pacific region is expected to overtake the United States to become the world's largest market in 2013. Also, between 2011 and 2015 the region's market size is expected to increase to 2.3 times its size in 2010, realizing a CAGR* of 18.3%. Interest in the casino business in rising worldwide due to the major economic benefits it brings. Good examples of such positive effects are Macau and Singapore, where the casino business is generating wide-ranging economic benefits. For Macau and Singapore, the largest positive effect has been an increase in tourism revenues. Visitors to Singapore from overseas surged from approximately 9.68 million in 2009, before its integrated resorts opened, to roughly 11.60 million in 2010, after they opened. As a result, international tourism revenues were up 49.2%, and nominal GDP rose 1.7% year on year. Other positives for Singapore included the economic benefits of construction investment before the integrated resorts opened; the creation of approximately 60,000 new jobs once they opened, including jobs created indirectly; and higher tax revenues. 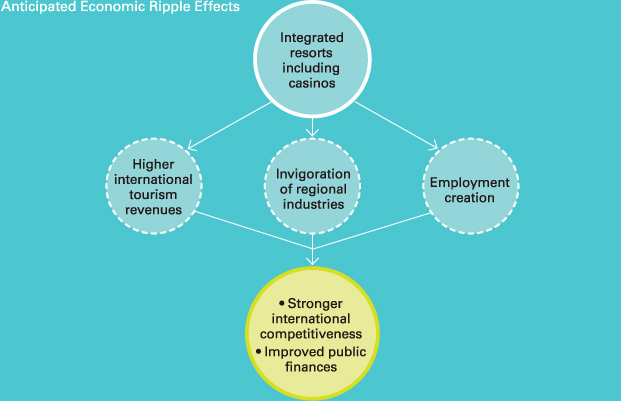 Regions that pioneered the legalization of casinos, such as Las Vegas, have used abundant expertise in casinos to curb their potentially negative social effects while maximizing their economic benefits. Such successful examples are spurring more countries worldwide to consider the casino business as a possibility. One country weighing its options is Japan. Sources: Casino market size figures are from PricewaterhouseCoopers LLP and Wilkofsky Gruen Associates. Singapore's overseas visitor numbers and tourism revenues are from the Singapore Tourism Board. Given the growing concern about the effects of Japan's aging population, the significant potential of the tourism industry as an economic driver is attracting attention in the country. Launched in 2003, a promotional campaign to encourage visitors from overseas, the Visit Japan Campaign, has proven successful. Visitors from South Korea, China, and other parts of Asia have increased substantially, with annual visitors from overseas rising around 60%, from approximately 5.20 million in 2003 to 8.36 million in 2012. On the other hand, looking at the numbers of tourists from overseas as a percentage of population, France is the leading tourist destination, with visitor numbers that are 1.2 times its population. In Japan, tourist numbers represent a mere 5% of its population. This is only one-ninth of the level in China, which is Asia's leading tourist destination by this measure. As an effective way of unlocking the burgeoning potential of Japan's tourism industry that these figures highlight, casinos are becoming a focus of attention. Without recourse to public funds, private-sector investment can establish casinos as a new tourism resource. Over the past decade, this has encouraged discussion on the possibility of lifting Japan's ban on casinos, which has focused on such related topics as higher international tourism revenues, the invigoration of regional industries, employment creation, stronger international competitiveness, and improved public finances as a result of increased tax revenues. Sources: Figures for visitors to Japan from overseas are from the Japan National Tourism Organization and other figures for visitors from overseas are from the United Nations World Tourism Organization (2011). In Japan, the debate about casinos began in 2001, with the basic concepts taking shape in 2004. Furthermore, the 2006 announcement of a basic policy for the introduction of casino entertainment to Japan established an overall organizational framework for casinos. Subsequently, 2010 saw the establishment of a nonpartisan Diet federation for the invigoration of the international tourism industry (the Diet federation for integrated resorts, also known as the Diet federation for casinos), which began deliberations in relation to the framework in earnest. In July 2011, the federation prepared an outline bill and reached a basic agreement on the principles forming the bill's framework. This bill envisions the establishment not only of casinos but also of integrated resorts that include convention facilities, accommodation facilities, and a range of leisure facilities. Furthermore, the federation agreed to define such facilities as designated integrated tourist resorts and the areas including them as designated integrated tourism resort areas. In August 2011, the federation reached a consensus on proceeding with deliberations in two stages. The first stage will seek enactment of a bill for the promotion of designated integrated tourism resort areas (the integrated resort promotion act), while the second stage will seek the enactment of a bill for the enforcement of designated integrated tourism resort areas (the integrated resort enforcement act). The former will define basic concepts, while the enactment of the latter will enable the operation of casinos. Viewing the management of integrated resorts including casinos as a new earnings opportunity, the SEGA SAMMY Group announced its intention to participate in this business area. If integrated resorts become a reality in Japan, a range of industries are likely to benefit. At the development phase, integrated resorts will provide real estate developers and casino machine manufacturers with business opportunities. Furthermore, the commencement of casino operations will enable casino operators to acquire earnings over the long term. An industry pioneer, the SEGA SAMMY Group began amusement center operations in 1965. During the intervening half a century, we have driven the industry's development and accumulated expertise. Also, we have honed our development capabilities for pachislot and pachinko machines and amusement arcade machines. This makes us one of the few corporate groups qualified to participate in the casino business in the areas of machine development and supply and casino operations. However, the casino business calls for a variety of know-how that our existing businesses do not have, such as expertise in attracting good customers on a regular basis. In addition, the scale of investments required is expected to be considerable. With this in mind, our basic approach is to form partnerships with casino operators who have track records overseas and thereby mitigate investment risk, acquire know-how, and enable the mutual use of management resources. The SEGA SAMMY Group has been steadily preparing for a foray into the casino business. One such preparatory initiative was our acquisition of all shares of Phoenix Resort Co., Ltd., in February 2012. Managing one of Japan's foremost resort facilities, Phoenix Seagaia Resort, which comprises hotels, spas, golf courses, restaurants, and international conference facilities, is giving us valuable expertise in the management of large-scale integrated resorts. Also, we have begun garnering casino management expertise in South Korea through a partnership with a major local company. 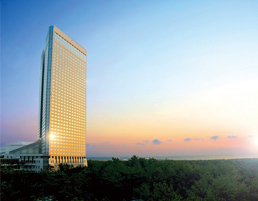 In May 2012, with the Paradise Group we established a joint venture, PARADISE SEGASAMMY Co., Ltd., tasked with planning, developing, and managing an integrated resort including a casino in the International Business Center area next to Incheon International Airport. The Paradise Group is a tourism services conglomerate that operates casinos and manages hotels and spas in South Korea, primarily through Paradise Co., Ltd. The group has a major presence in the country as a pioneer in the casino industry and has accumulated extensive related know-how. Holding a 45% stake in PARADISE SEGASAMMY, we will actively participate in management and dispatch directors and employees to the company. 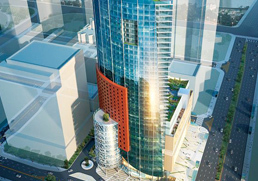 Furthermore, PARADISE SEGASAMMY acquired a casino, Paradise Casino Incheon, that the Paradise Group already operates in the International Business Center area next to Incheon International Airport in July 2013. Through this acquisition, we plan to gain expertise and experience in casino management. At the same time, we intend to use the license of Paradise Casino Incheon in the International Business Center area to expand the facility. In another South Korean project, we are getting ready to participate in the development of Centum City, which is a multi-project urban development area in Busan that will incorporate leading-edge functions in relation to information, communications, video, entertainment, and international business. Plans call for newly established SEGA SAMMY BUSAN INC. to invest approximately ¥35 billion to develop a resort complex comprising a hotel, entertainment facilities, and commercial facilities, which the company will operate. Directly connected to Centum City subway station, the land we have acquired boasts outstanding access. Furthermore, as an extremely prestigious location with a concentration of commercial facilities—including the world's largest department store—the area has strong customer drawing power. To curb risk, we intend to commission partners who are experts in hotel management. At the same time, we will exploit SEGA's know-how in amusement center operations to generate stable earnings while acquiring expertise in the development and management of resort complexes. In 2013, deliberations on legislation for integrated resorts have become more concrete. The basic act, the integrated resort promotion act, may be submitted to an extraordinary Diet session as early as fall 2013. Assuming the bill is enacted at this time, the subsequent schedule will be as follows. Within three months of the promulgation of the integrated resort promotion act, detailed deliberations will begin on the integrated resort enforcement act. The integrated resort promotion act stipulates that the integrated resort enforcement act must be prepared within two years. Therefore, it is expected that, after obtaining the opinions of experts and the understanding of the public and drafting the act and its statutes, the enactment of the integrated resort enforcement act will take two years at the most. Once enacted, this act will stipulate the administrative framework for the casino industry, and procedures will begin in earnest to realize the framework. Accordingly, the next stage will entail the establishment of regulatory bodies that will prepare for the selection of private-sector companies and supervise the actual operations of casinos. After this, applications from local public bodies wishing to attract integrated resorts will be examined, and designated integrated tourism resort areas will be stipulated. Based on public offerings, local public bodies receiving designation will select privatesector companies to plan, fund, develop, and operate designated integrated tourist resorts and conclude development agreements with them. Selected private-sector companies will then apply to the national regulatory body for licenses while proceeding with development in earnest. If these processes advance smoothly, actual casino operations could begin around 2020. This careful, scrupulous procedure reflects a desire to develop casinos as an industry based on strict supervision that ensures soundness and safety. Because waiting for the enactment of the integrated resort enforcement act would not leave sufficient time for local communities to build consensus or for companies to prepare commercial operations, local public bodies wishing to attract casinos and private-sector companies from Japan and overseas aiming to participate in the casino business are likely to have already begun concrete preparations by the time the integrated resort enforcement act is enacted. Around 2016, practical discussions on integrated resorts will probably have advanced. By this time—coinciding with legislative progress—PARADISE SEGASAMMY's integrated resort in the International Business Center area and SEGA SAMMY BUSAN's resort complex in Centum City, mentioned earlier, are likely to have opened for business. Thus, through far-sighted initiatives, the SEGA SAMMY Group intends to continue steadily and proactively preparing for the future.